Hundreds visit Rabbi Kook's house in Jerusalem, participate in ceremony to greet one's rabbi on holiday, Jerusalem Rabbi Aryeh Stern. Hundreds of Jews arrived today at Rabbi Kook's home in Jerusalem where they met with Jerusalem Rabbi Aryeh Stern to fulfill the biblical injunction to greet one's rabbi on the holidays. 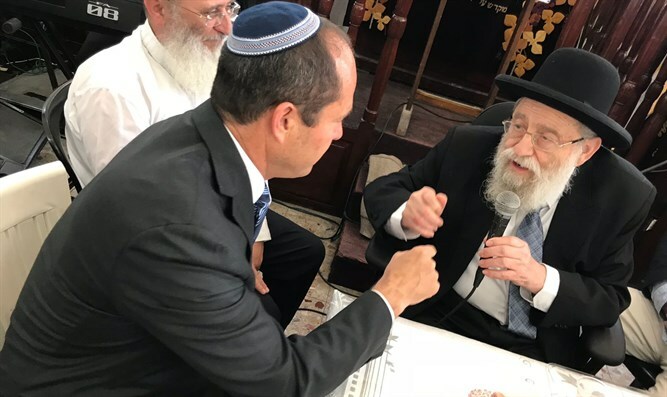 Among participants were Jerusalem Mayor Nir Barkat, MK Moti Yogev, Deputy Mayor Dov Kalmanovitch, City Councilor Aryeh King, Rabbi Uri Sherki, Rabbi Chaim Fogel, Rabbi Yochanan Fried, Rabbi Eliyahu Abergil, and Sur Baher Mukhtar Dr. Ramadhan Dvash. Rabbi Stern greeted participants and the Jewish people with a happy Passover.